The ‘Urania’ is a 36 centimetre-high aluminium cast statuette with feminine forms, designed by the exceptional artist Tone Fink. Such figurines are awarded to the winners of the Feature Film Competition, Documentary Competition, Promising Debuts Competition and Short Film Competition, each determined by the juries. 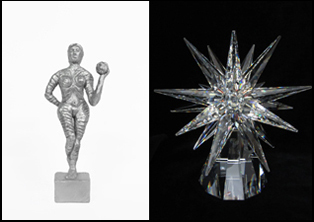 In 2017, Art Foundry Loderer became co-sponsor of the Urania figurines, which are cast at their family-run business in Feldbach. The winner of the Feature Film Competition will receive 5,000 euros cash and production services amounting to 50,000 euros, endowed by Nu Boyana Film Studios from Bulgaria, which is one of Europe’s leading film production companies. The Danny Lerner Award, the name of the new prize, honours the late Israeli screenwriter, director, and lm producer of the same name. 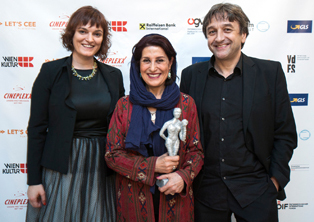 The three other awards come with 1,500 euros in prize money. The prize for the best feature film debut is provided by UNIQA International. The winner in this category also receives 1,000 euros worth of services by LISTO MediaServices Cine + TV Postproduction. The prize for the best short film is sponsored by the Collecting Society of Filmmakers (VdFS). 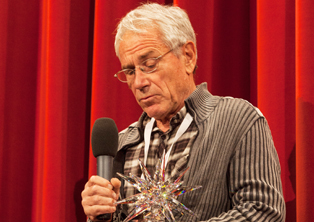 The ‘Star of the Urania’ award is an elaborate, valuable, and unique prize awarded annually to an extraordinary person from the film industry for their lifetime achievement by the festival organisation. And since this prize was not awarded at all in 2016, this year it will be handed to two great female filmmakers of European cinematography: Kira Muratova and Márta Mészáros. Another new addition is the Cineplexx Distribution Award amounting to 20,000 euros worth of distribution services, which aims to help one of the feature films in the competition to launch a successful cinema release with the largest cinema chain in Austria. 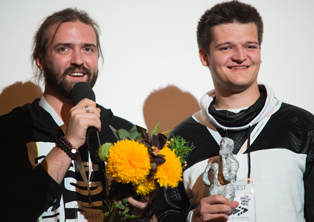 As in the previous years, there are two Audience Awards for the best short film and feature-length film as well, which include prize money of 1,000 euros, sponsored by Western Union International Bank. And there will be honourable mentions in all categories, decided by the juries. Last but not least, the team which produced the best short film during the Talent Academy will be honoured with 1,000 euros in prize money. In this spirit, may the best ones win! Tone Fink was born in Vorarlberg in 1944. After his studies at the Academy of Fine Arts in Vienna, he was able to make a great name for himself in various artistic fields. His oeuvre as an illustrator and painter is as abundant and critically recognised as that of Tone Fink, the object and performance artist and filmmaker. His versatility and ability to readjust constantly makes Fink one of the most enduring representatives of modern Austrian art. The Croatian actress Ksenija Marinković for her performance in The Constitution. "LET'S CEE" by Vladimir Beldian, Berin Češkić, Achmed Abdel-Salam & Martina Netíková.